Gifts from the Pirates: "Drawing is the honesty of the art. There is no possibility of cheating. It is either good or bad." Although Ive written about Seth's drawings before ('Drawing is simply a line going for a walk'), whenever he has finished a piece that he is doing and he shows us i am always surprised and secretly in complete awe. Id say i was quite arty and i can draw but nothing that comes from the end of my pencil has anywhere near as much character as the things drawn by Seth. I think his style is truly amazing and I'm so proud of him. With most of the characters he draws there is so much detail put in yet they are drawn so simply. I think I'm going to have to start framing my favourites. As i mentioned in the last post, they are great because he doesn't even need to tell anyone what he has drawn because they are so well done it is obvious (unless of course you really don't know many super heroes etc). Its great that he loves to draw and we will always encourage him to be creative. I remember drawing a lot with my Dad when i was younger, those lovely memories never go away and i hope our boys feel the same when their older. I think its so cute how he has written 'yodur', i wish i still had things like this from my childhood to look back on but sadly having to distance myself from a lot of my family has shattered any chances of me even getting old photographs of myself. Seths writing has come on so well since being at school, he has a rare muscle condition and we thought it would really effect the speed his writing developed but he doesn't let anything bother him and he just gets on with things. Everybody loves him and were really proud of everything he does. This morning before school i asked him if he would draw me a picture of Gotham's finest, and yet again he blew me away with his adorable characters. He likes to have his action figures in front of him to draw and when he is choosing a colour he holds the pen up to his figures to make sure they are the right shade. He wanted me to cut out the drawing in the middle as he deemed it "not good enough" but i love all of his drawings so it had to stay. Well it would have been rude for him not to have paid homage to the villains too so as we had plenty of time before putting on his uniform etc he decided to draw a few of his favourites. everything he draws comes out so well and the characters always have nice friendly faces. I should ask him to draw someone a bit more gruesome like the Toxic Avenger, Pinhead or Freddy krueger just to see how they come out. Seth's drawing also comes in handy when its peoples Birthday's, who doesn't like receiving a home made card drawn by a child! they are so much nicer to keep than anything hallmark could produce. 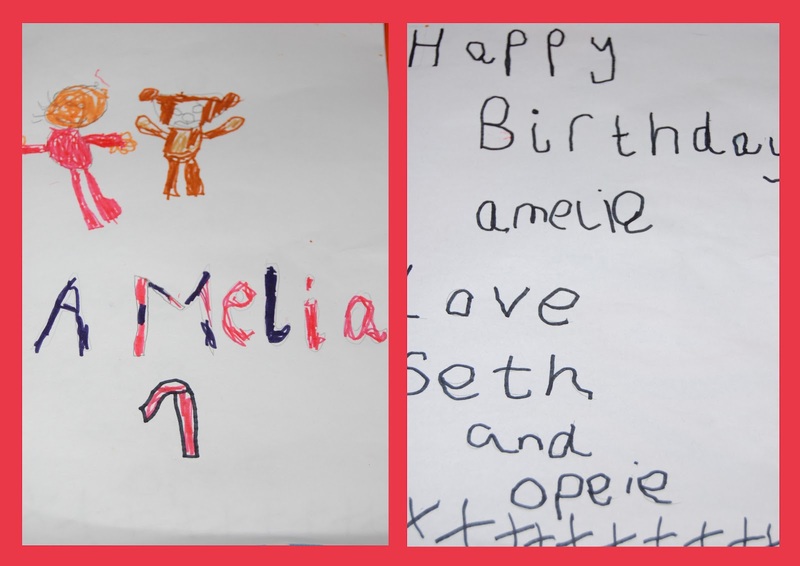 Yesterday was our neighbour Amelia's first Birthday and Seth drew her a lovely card. Opeie has started getting in on the drawing action too and while mommy was at work a couple of days ago we made her a card. It was mainly for him to say sorry for being awake through the night and how much he loves her (we all do). Being quite arty ourselves we will always encourage the boys to express themselves whichever way they feel. And we do what we can to include as many different media's as we can. Especially the messy one's, Me and Seth have been talking about Paper mache Star Wars masks for in the summer holiday so watch this space.